My Predictions Coming True: Again, Anoopie is reading up on my blog! As I suggested, he sang Smokey! ("Baby Baby", although if he was smart, he would have taken all of my advice and sang the song I suggested, but we'll save that for my High Light of the Night). I do agree with Simon, because at one point there in the beginning, Noop did seem like he might become narcoleptic and fall asleep right then and there on the stage. Little nervous though about Randy's advice to him about hyping it up next week. (Can't get chest pumping, my prerogative bangs out of head). And holy crap!! I have to pat myself on the back because not only did Simon talk to Lil about the "moment" like I have been referring to, but he also mentioned that she should have sung "I Heard it Through the Grapevine"! Please see post below, thank you very much. Now only if she would read my blog like Anoopie. Okay, done gloating now. Lil brought some hotness to the "Heat Wave", but I don't know . . she's still not doing it for me. And I think she might also be getting on my nerves a bit because well, she talks exactly like, and I mean exactly like, Dawn from Making the Band (which is a no-no in my harsh little critical world). The I'm Sick To My Stomach Moment of the Night: Danny Gokey not heeding the Smokster's advice!! For shame, Danny. For shame. He even admitted Smokey has been in the business longer than him! He even said he would sing the "you're out of sight" lines! But then lo and behold, as soon as I heard the back up singers singing those lines, my eyes bugged out! Just who does he think he is!?!?!?! Can We Just Get It Over With Already? Aw, poor Scott MacIntyre in his salmon colored pants with "Can't Hurry Love." It just kind of stayed on a level field for me . . if we can't hurry love, can we hurry the performance along please? And he probably became even more confused when Ryan told him that Paula pulled out "crowns" and a coloring book for Simon. And really people, how many you-know-what-references are we going to have this season? First with Del Toro and Ryan and now with Simon and Paula. Geesh. And while I'm at the so over it part of my blog, I come to my favorite, Michael Sarver. Sigh. I admit that I was a little nervous because I thought he turned in a better performance than what the judges so harshly beat him up on. But still, Mikey-Boy, you ain't no Carrie Underwood, so you might want to stop working those microphone hand gestures like her and the holding audience members' hands bit, okay? And i think that is only the 817th time we have heard Kara ask, "who are you as an artist?" That's what we wanna see. Pimp Slot: So happy to see Allison get the last spot of the night. I think the judges/producers sensed my worry and realized we need to do something about America's mistake! She rocked it out, no shocker there. I just really wish they would give her back her long hair. Giraud sang "Let's Get it On". Not bad, but i was really hoping for "Superstition"! Kris sang "How Sweet It Is". The girls and Smokey swooned, as Kris came into his own, looking mighty comfortable on that stage. He handled Simon's conceit comment very well giving us that Kris charm, but I'm kinda bothered when I have to look at little wifey in the audience . . show me some more of that other family member of his. The overzealous one in the argyle sweater . . I liked him! So what did you all think of Motown week? Was it ooooo, baby baby? Or will you be developing some new tracks on your face? 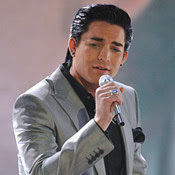 Adam is the next American Idol!! A True Talent!!!!! I think it's worth keeping Scott around for one more week. I want to give him one more chance to surprise me. He really does have a good voice with a lot of tender inflections, but it's not a BIG voice, so it gets lost on the big stage. Yes, Adam is smart because I think he knew he had to soothe those fans he un-nerved a little bit with his red-light district ring of fire. And here here! Sarver or Scott. Sarver or Scott. Come on, let's chant it all together now . . Sarver or Scott. It BETTER be SARVER!!!! If Allison is in the bottom three tonight, I will have to throw my tv out the window.